August 3, 2015, 9:03 PM · There are so many misconceptions about auditions that it’s hard to know where to start when debunking them! Surely one of the biggest is that you must play absolutely perfectly or you’ll be cut. If that were true, nobody would ever win an audition! Perfection is simply not attainable. It’s a target to aim for, but not a realistic goal. Certainly those players who win big auditions play at a stellar level, but they make mistakes here and there. The question is, where and how? Another misconception is that everyone comes into auditions playing a great concerto (the old “any kid from conservatory can play a flawless Tchaikovsky” line) but that the real test comes in the excerpts. Some people do play great concertos and lousy excerpts, but that’s actually pretty rare. The fact is that the most important playing of any audition is the first selection. Usually that’s a concerto. For you, it will be the Mozart concerto exposition. First impressions are crucial in real life. Just think about what happens when you meet someone: within a few seconds you form a mental picture of them. It’s unavoidable! This picture shares some things with the actual physical appearance of the person standing before you; there’s plenty of overlap. But instinctively you emphasize certain details over others. Some you ignore, and others stand out. Have you thought about what people notice about your appearance at first glance? You’ve been given (or have worked for) a basic body type, and you wear clothes over that body. You may or may not accessorize. You may be impeccably, acceptably or sloppily groomed and made up. And the way you use your voice and gestures could be low-key or flamboyant. You’ve seen all of these traits in the people you’ve met. And when you make the subconscious decision as to whether you like a person, these traits don’t matter so much individually, unless one in particular stands out so much that it’s impossible to ignore! It matters, though, how the traits work in concert. Therefore, if an audition is like a blind date, or more accurately a “speed dating” session, everything must come together quickly and in harmony. There is a range of generally attractive body shapes, and for each of those there are clothes to complement and hide the inevitable imperfections. Some people can pull off “risky” humor, but there are some jokes that should never be told on a first date, and some never at all! Makeup, skillfully applied, enhances facial shapes. But there is always a point at which the makeup is noticed rather than the face. The parallels to violin playing, while not drawn exactly, exist nonetheless: sound quality, phrasing, vibrato. There is a range for each attribute that qualifies as acceptable. There are many combinations that qualify as pleasing. And a few could be called great. Greatness, achieved as a first impression and sustained over the course of several minutes, can win an audition. It’s even easier to spot dishonesty or fakery in a person. Instead of sympathy, the reaction is usually aversion, even disgust! Dishonest playing, effect without substance, turns off a committee very quickly. Giant swings in dynamics, extreme sound colors, and maximum articulation will come off as dishonest, unless they’re clearly written into the music. It can be frustrating to “be yourself” in your violin playing. Who are you, exactly? And should you try to change who you are over the course of this Challenge? I suspect that by going through the Challenge, you very well may change certain things about your personality, both on the violin and away from it. But don’t make it a conscious decision just yet. Continue “working out” with your scales and etudes in order to get yourself into shape. And open your ears to a violin sound that pleases you. Chances are, it will be pleasing to your listeners as well. Focus now on quality and comfort rather than execution or perfection. In the accompanying video I demonstrate some of the exposition of each Mozart concerto option: 3, 4 and 5. I don’t go into every stylistic choice that you can make. Rather, I emphasize the importance of sound quality no matter the dynamic or technical challenge. I pay special attention to the opening, as you should. August 4, 2015 at 09:27 AM · "Be yourself" --- great advice! It's always easier to play "as my usual self" rather than to play like someone else, especially at auditions or performance. 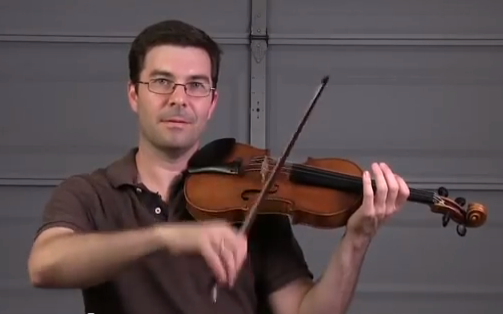 August 4, 2015 at 11:00 AM · Dear Nate, what a privilege it is to be able to watch such a splendid video lesson by such a wonderful professional violinist! I also really like the setting (it looks like your own garage at home) which gives a down-to-earth touch to it. I also admire the way you keep your calm, this calmness definitely transfers to the student. What does strike me is your use of the fourth finger. You actually use largely the right side of the fingertip (that is, the right side when looking at your left hand with the palm facing you). There are exercises in Simon Fischer's Basics that encourage playing on opposite sides of fingertips with the aim of opening up the base knuckles. But you actually seem to do it all the time in daily playing, and very effectively so. Very interesting. I remember a discussion here on violinist.com where Jeewon Kim (December 28, 2005) refers to these exercises and claims that you cannot actually play like that, and even Simon Fischer himself chiming in (quite a bit later, March 18, 2010). But you show the opposite! As a result your vibrato with the fourth finger is more a cellists's kind of vibrato due to the sideways contact with the string. At any rate your sound is beautiful uniformly over all four fingers. Please forgive me for making these observations, as a passionate amateur it is really fascinating for me. August 4, 2015 at 02:19 PM · Dynamics? August 4, 2015 at 04:12 PM · Wow that video was wonderful. Thanks for the lesson especially on bow speed, that was really enlightening. I was reminded of a story I heard long ago, and I think it was about Pavarotti. Someone asked him to compare himself to Caruso and he replied that any tenor can make himself sound like Caruso for a little while, but then his voice will be completely shot. Thanks for your advice. Do you know what the NY Phil. requirements are for the semi-final and final rounds or what one might expect to be asked in those rounds? Did you have this type of performers in audition? August 8, 2015 at 10:32 PM · Jean, interesting observation and I'm posting a new discussion topic about it! As far as what would be asked, I really have no idea except that it will be more than was asked in the prelims. So count on one or both concerto expositions plus maybe 10-15 minutes of excerpts in the semis. Final round will include piano so likely both concertos (maybe a complete Mozart movement but not necessarily) plus a good 15-20 minutes of other selections. Also there would be more interaction, i.e. asking candidates to play things differently. August 8, 2015 at 10:39 PM · Hi Liz, there honestly isn't much playing with little to no vibrato, mostly because the selections asked are almost always Beethoven and later. One can debate whether (and how much) vibrato was used then, but since we play that music in symphony orchestras with vibrato now, that's the general style committees are looking for. But as with everything there has to be taste and variety! It's unusual (but not unheard of) to actually ask for the Bach selection in a section audition these days precisely because there are so many styles in which to play. I personally wouldn't be offended at all if someone wanted to play Bach in an earlier style, as long as it was well done! But the rest of their audition would have to convince me that their ideas weren't so far away from the rest of the group's as to make them unworkable in the section.